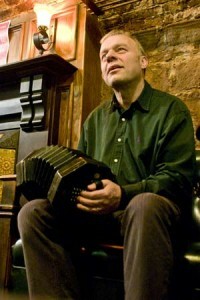 Steve Turner is one of those artists who have been the backbone of the British folk scene but has been out of circulation as a professional musician for around eleven years. He was tempted back recently, in part by Mick Peat but, as he said in a recent article – “folk music seems to get into your blood!” – and four or five years ago he started doing a few gigs again and came gradually back on to the folk scene. Steve’s musical story starts in the Manchester folk scene in the late 60s. His route to music was via the Beatles and then Dylan. Steve was playing a floor spot in 1971 where Canny Fettle were the main act and Bob Diehl, their fiddler, asked if he wanted to join the band. Steve was in the group for seven years during which time they made two albums, ‘Varry Canny’ and an LP of tunes from the Joshua Jackson collection – both groundbreaking albums for their time. After Canny Fettle, Steve spent three years dealing in folk instruments then went fully professional as a musician from 1980 until 1991. He made four solo albums, all with Fellside, setting the standard for a number of songs. Steve thinks that this recording is his best work to date, which is saying something as he sets his own standards very high. As Series Director I have kept a very light hand on the production reins of these recordings and in every case I have been well rewarded by my trust in the artistry and taste of all of the singers presented within The Tradition Bearers. Although there is a common thread of tradition within the body of recordings, each singer brings their own distinctive interpretation to any song. I consider Steve to be one of a few in any generation who also takes an instrument to another level. There is depth in these songs and in these performances and I hope that they will bring you pleasure with each listening. This is my first recording in CD format, and my first album since my ‘Braiding’ LP (1986). It has taken just over three years to complete, so has been pretty much of a marathon for various reasons. Things have moved on over the period that I’ve been making this CD, mainly in that I’ve started to accompany some songs on the cittern made and kindly donated to me by Kai Dase. I’ve also reassessed a couple of songs from earlier albums; the Glendy Burke and Isle of St Helena. I’ve noticed my approach to singing has changed over the years; a natural progression insofar as one of the few advantages of the ageing process is that experience of life offers perhaps a little insight into and more perception of a song, both vocally and emotionally. One of the things that I am trying to do with my music is to extend the boundaries and experiment with songs that can be accompanied on the English concertina and still hopefully sound credible, for example ‘Where’er You Walk’, and make people realise the potential of the concertina as an accompanying instrument. The songs on the album encompass the whole spectrum of my musical life, from almost the beginning to songs I have learnt very recently after my twelve year break from the folk scene. Most of the songs on this album are traditional, not because I have a background or heritage in that or any other type of music, but because the first music I encountered when I began to sing in public was folk songs. My father was ‘the Man from the Pru’ and my grandfather was a barber – not a great source of songs, in fact the only hairdressing songs I know were written by Mozart and Rossini. If I like a song enough, and feel it has a strong tune and a good story, I will try and interpret it in my own style. I enjoy opera and listen to it and sing it enthusiastically, though not necessarily with a lot of skill. All solo and duo tracks on this CD are played live with no concertina double tracking. The concertina I play on this record is a wooden ended 64 key Wheatstone English system bass / baritone / tenor aeola in High Pitch (i.e. A-452). Its serial number is 32306 made in 1929. It is an ex-Salvation Army band instrument with the buttons arranged to be played comfortably in flat keys. The four bottom buttons on the left hand side have ‘anglo’ action, i.e they play two notes per button, thus extending the range of the instrument to 68 notes. The Doncaster Salvation Army band was one of the top bands in the country in the early 20th century and I bought the concertina in the late 1970s from a Salvation Army Colonel who played in the in Doncaster Band in the earlier years of the century. The piccolo concertina I use on ‘Dudley Boys’ is a 48 key Wheatstone amboyna ended aeola with gold buttons, serial number 30953 made in 1926. It makes more noise than the rest of the band put together if not seriously “strangled”!